A mass of art from the original Canning Stock Route exhibition laid out on the Country which it reflects. 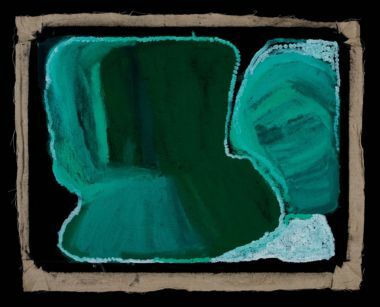 Renowned Indigenous artists are visiting Japan for two festival days this month, celebrating the opening of the National Museum of Australia’s One Road: Aboriginal Art from Australia’s Deserts exhibition in Chiba, outside Tokyo. This is a touring exhibition based on the NMA's ground-breaking Yiwarra Kuju exhibition in 2010. Artists Curtis Taylor, Mervyn Street and John Nargoodah are in Japan to attend a family festival day today at Chiba’s Ichihara Lakeside Museum, where One Road is currently showing. One Road features 34 paintings drawn from the Canning Stock Route collection and includes works by Australia’s most renowned Aboriginal artists. This weekend, the artists will also attend a two-day autumn festival at Echigo-Tsumari (three hours’ drive north of Tokyo), where a series of panels are being exhibited reproducing Canning Stock Route art from the Museum’s collection. Curtis Taylor has a film in the One Road exhibition while both Mr Street and Mr Nargoodah worked as stockmen on the Canning Stock Route. Mr Street is represented in the National Museum’s collection. The artists will participate in painting and print workshops, sand drawing performances, film screenings and talks to showcase the story of the Canning Stock Route to Japanese audiences. They will be accompanied by National Museum senior curator, Dr Michael Pickering. “We are very excited to be bringing these three important artists to Japan to allow Japanese audiences to gain further insights into the story of the Canning Stock Route and into Indigenous culture more broadly,” said National Museum director, Dr Mathew Trinca. “We thank the Australia-Japan Foundation for their support in promoting greater understanding internationally of Australia’s complex history and of the intersection of the Indigenous and non-Indigenous experience,” said Dr Trinca. 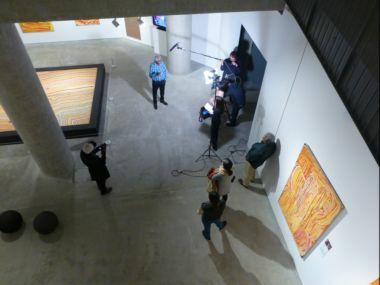 The exhibition explores the history of the famous Western Australian droving road through the stories of the country, especially the Aboriginal wells that were vital to the survival of cattle, that determined the Canning's route. Drawing on the works of desert artists and the stories of traditional custodians, the exhibition tells the story of the Canning Stock Route's impact on Aboriginal people, and the importance of the country surrounding it. 'Kirriwirri' (2008) by Jan Billycan, currently on show in Japan in the National Museums's touring exhibition, courtesy Short St Gallery, Broome.